* New photo photospecial page: Ginkgo leaves in fall. 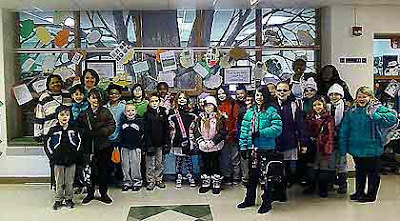 Principal Angela Sopko, along with students and teachers at Empire Elementary School at the school in Freeport Ill., pose in front of the Ginkgo tree - “The Tree of Knowledge” that the project has become known as. Reporter Vonnie Maple of the Journal Standard has featured several articles about the Ginkgo in her Tree Tales column (read story here and here). One article featured a photo of this very own Ginkgo, planted in 1991 in honor of David Ludewig, who was a board member for Freeport School District. 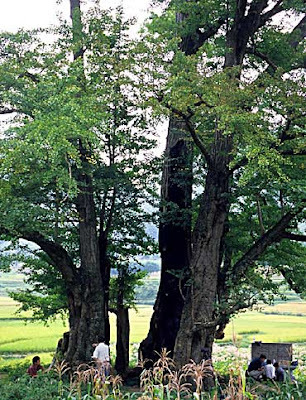 Principal Sopko explained that since the running of the story on the Ginkgo outside their school, they have become determined to find out as much as they can about this ancient tree with the unusual leaves. She said she had been looking for a community project to start and thought this would be a good idea. Empire classrooms have been invited to research the Ginkgo and share their findings on a sheet of paper to display. Families and community members were also invited to submit information as well. Art teacher, Gwen Schuster, has created a ‘Ginkgo masterpiece’ on which the findings are posted. "Jai - Buddha's delight is also called monk's food and is served at the Chinese Lunar New Year celebrations. Enjoy this dish with family and friends for a healthy, wealthy and prosperous Chinese New Year! Heat 2 Tbsp red bean curd and 2 Tbsp fermented bean curd in wok on high heat. Mash with back of spatula until broken into small bits. Add liquid seasoning mixture. Bring to boil for 2 minutes. Add shitakes, wood ears, lotus root, water chestnuts, arrowroot, ginkgo nuts, black hair seaweed. Cook for 4 minutes, until slightly softened. Add bean curd sticks, fried wheat gluten, fried tofu pockets, noodles. Toss well. Correct seasoning. Add Napa cabbage, snow peas. Serve immediately. Makes about 8 servings. " From video by Veggietorials on YouTube.